With a four-year, $707,000 grant from the American Cancer Society, Yanchang Wang, assistant professor of biomedical sciences in the Florida State University College of Medicine, hopes to learn how a particular enzyme could possibly help put the brakes on the runaway cell division process that occurs in many forms of cancer. Wang's research involves the role of an enzyme known as Cdc14 in deactivating the cell division process set in motion by another enzyme, Cdk1. "From this proposed experiment, we expect to find a new way to regulate cell division," Wang said. "Cdk1 is the key driving force for cell division, so it's quite important." The enzymes Wang is studying are part of the cellular signaling processes that protect genes and chromosomes when cells divide, ensuring that the number of chromosomes in each new cell is precisely correct. This process is critical in that an abnormal number of chromosomes can lead ultimately to cancer. Wang conducts his experiments on yeast because it abides by the same regulatory processes during cell division as human cells. "Yeast is a single cell, but it is really powerful and it will answer different kinds of biological questions, especially for the regulation of cell division," Wang said. 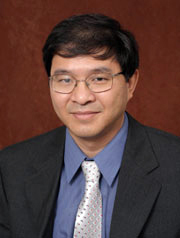 With the addition of this new grant, Wang has now attracted more than $1.3 million in external research funding since arriving at the Florida State University College of Medicine in 2003 as one of the first faculty recruited to the college's department of biomedical sciences. The American Cancer Society grant follows a $441,000 grant from the James and Esther King Biomedical Research Program and a $240,000 grant from the American Heart Association, with which Wang laid the groundwork for his newest hypothesis. Myra Hurt, associate dean for research and graduate programs, said Wang is one of only about two dozen Florida researchers to receive funding from the American Cancer Society this year. "At the beginning of the 21st century, in spite of more than 30 years of the most intense biomedical research the world has ever known, cancer remains a major cause of death in our country," Hurt said. "The hope is that Dr. Wang's research will uncover new therapeutic targets and diagnostic tools for cancer treatment and prevention." "The hope is that Dr. Wang's research will uncover new therapeutic targets and diagnostic tools for cancer treatment and prevention."